Astronomers studying gas clouds in the famous Whirlpool Galaxy have found important clues supporting a theory that seeks to explain how the spectacular spiral arms of galaxies can persist for billions of years. The astronomers applied techniques used to study similar gas clouds in our own Milky Way to those in the spiral arms of a neighbor galaxy for the first time, and their results bolster a theory first proposed in 1964. Right, radio image showing location of Carbon Monoxide gas. The Whirlpool Galaxy, about 31 million light-years distant, is a beautiful spiral in the constellation Canes Venatici. Also known as M51, it is seen nearly face-on from Earth and is familiar to amateur astronomers and has been featured in countless posters, books and magazine articles. "This galaxy made a great target for our study of spiral arms and how star formation works along them," said Eva Schinnerer, of the National Radio Astronomy Observatory in Socorro, NM. "It was ideal for us because it's one of the closest face-on spirals in the sky," she added. Schinnerer worked with Axel Weiss of the Institute for Millimeter Radio Astronomy (IRAM) in Spain, Susanne Aalto of the Onsala Space Observatory in Sweden, and Nick Scoville of Caltech. The astronomers presented their findings to the American Astronomical Society's meeting in Denver, Colorado. 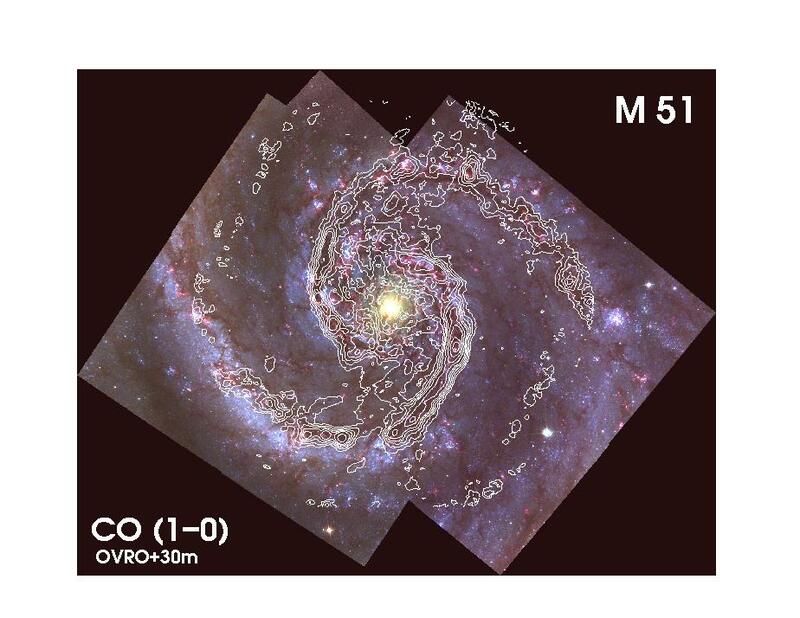 The scientists analyzed radio emission from Carbon Monoxide (CO) molecules in giant gas clouds along M51's spiral arms. Using telescopes at Caltech's Owens Valley Radio Observatory and the 30-meter radio telescope of IRAM, they were able to determine the temperatures and amounts of turbulence within the clouds. Their results provide strong support for a theory that "density waves" explain how spiral arms can persist in a galaxy without winding themselves so tightly that, in effect, they disappear. The density-wave theory, proposed by Frank Shu and C.C. Lin in 1964, says that a galaxy's spiral pattern is a wave of higher density, or compression, that revolves around the galaxy at a speed different from that of the galaxy's gas and stars. Schinnerer and her colleagues studied a region in one of M51's spiral arms that presumably has just overtaken and passed through the density wave. Their data indicate that gas on the trailing edge of the spiral arm, which has most recently passed through the density wave, is both warmer and more turbulent than gas in the forward edge of the arm, which would have passed through the density wave longer ago. "This is what we would expect from the density-wave theory," Schinnerer said. "The gas that passed through the density wave earlier has had time to cool and lose the turbulence caused by the passage," she added. "Our results show, for the first time, how the density wave operates on a cloud-cloud scale, and how it promotes and prevents star formation in spiral arms," Aalto said. The next step, the scientists say, is to look at other spiral galaxies to see if a similar pattern is present. That will have to wait, Schinnerer said, because the radio emission from CO molecules that provides the information on temperature and turbulence is very faint. "When the Atacama Large Millimeter Array (ALMA) comes on line, it will have the ability to extend this type of study to other galaxies. We look forward to using ALMA to test the density-wave model more thoroughly," Schinnerer said. ALMA is a millimeter-wave observatory that will use 64, 12-meter-diameter dish antennas on the Atacama Desert of northern Chile. Now under construction, ALMA will provide astronomers with an unprecedented capability to study the Universe at millimeter wavelengths. The Whirlpool Galaxy was discovered by the French comet-hunter Charles Messier on October 13, 1773. He included it as object number 51 in his now-famous catalog of astronomical objects that, in a small telescope, might be mistaken for a comet. In 1845, the British astronomer Lord Rosse discovered the spiral structure in the galaxy. For amateur astronomers using telescopes in dark-sky locations, M51 is a showpiece object.